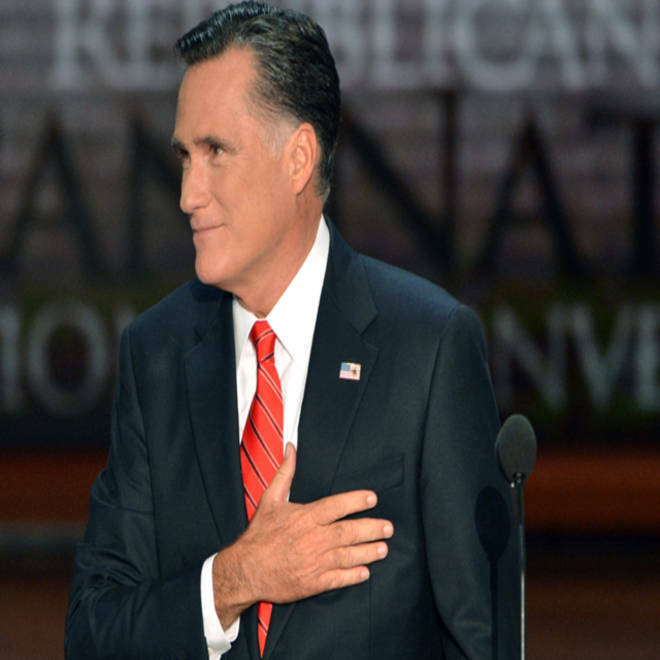 TAMPA, Fla. – Accepting the Republican presidential nomination, Mitt Romney vowed to move America past what he called the “disappointments” of President Barack Obama’s four years in office if elected to the White House in November. In a speech that hearkened back to an America typified by Romney’s upbringing “in the middle of the century in the middle of the country,” the nominee argued he was the candidate best suited to rejuvenate a flagging economy. "Today, the time has come for us to put the disappointments of the last four years behind us," Romney said. Mitt Romney stands with his wife, Ann Romney, and family as Paul Ryan and his wife, Janna Ryan, stand with their family on stage as balloons drop during the final night of Republican National Convention in Tampa. The nationally televised address, the biggest of Romney’s political career, sought to better introduce him to Americans and erase the low favorable rating from which he suffered before the convention. He made barely veiled overtures toward winning women voters, among whom he trails Obama by 10 points in the latest NBC News/Wall Street Journal poll. But Romney also attempted to project a forward looking vision of America, mentioning the word “future” a total of 13 times during the speech, and the word “tomorrow” three times. In terms of policy, Romney leaned heavily on the broad planks he’s already outlined as a candidate. He hit Obama on taxes, health care and foreign policy, though he scarcely detailed his own plans on Medicare and made no mention of Iraq or Afghanistan. Romney’s speech instead intended to seize on voters' disillusionment in Obama, based on the lofty promises made by the then-Illinois senator during his 2008 campaign. And as if to preempt Democratic criticism that he was rooting for failure, Romney said he had hoped for just the opposite. "I wish President Obama had succeeded because I want America to succeed. But his promises gave way to disappointment and division," Romney said. "This isn't something we have to accept. Now is the moment when we can do something. With your help we will do something." Thursday was the culmination of a years-long effort by Romney to capture the nomination, a goal which had eluded his father, the former governor of Michigan. Romney unsuccessfully sought the GOP nomination in 2008, and struggled during the 2012 primaries to rally the party’s core of conservatives behind his candidacy before pulling away. This cycle’s primary – during which Romney boasted of having a “severely conservative” governing record – took its toll on him as a general-election candidate, giving fodder to Obama’s re-election team to use against the Republican during an unforgiving summer campaign. To that end, much of the Republican National Convention this week in Florida was directed toward reposturing Romney for a general-election audience. Romney relied on other surrogates earlier in the evening to round out his personal story. Friends, family members, and former co-workers delivered speeches about his leadership in business and government, along with his time in the Mormon Church – a less-discussed aspect of the nominee’s persona. Republicans gather in Tampa, Florida to officially nominate Mitt Romney and his running mate, Paul Ryan, as the party's candidates for the 2012 presidential election. There were high and low points throughout the convention, and some unusual moments – such as actor Clint Eastwood’s ad-libbed speech to a chair jokingly intended to represent Obama. Romney sought to address several of his most glaring political vulnerabilities in his acceptance speech. He tried to defray attacks on his career as co-founder of Bain Capital by describing some of the most successful byproducts of the venture capital group's best-known successes. And Romney celebrated the achievements of women in the private sector and in government, drawing on the example of his own mother's bid for the Senate. "As governor of Massachusetts, I chose a woman lieutenant governor, a woman chief of staff, half of my cabinet and senior officials were women, and in business, I mentored and supported great women leaders who went on to run great companies," Romney said. Romney and his veep nominee, Paul Ryan, will take no break from campaigning after a high-stakes week for their ticket, stumping Friday in Florida and Virginia and keeping a busy schedule throughout the weekend. Obama’s convention, meanwhile, will make the case for a second term at the Democratic National Convention next week in Charlotte, N.C. The dueling conventions – representing some of the few natural opportunities for candidates to bend the arc of the election – signal the onset of the most intense portion of the general election. Ryan and Romney, along with Obama and Vice President Joe Biden, will set out to a handful of battleground states over the next 67 days to sway a winnowed group of independents and swing voters who could determine the outcome of the election. One such state is Florida, the site of the Republican National Convention, and a state on which Romney’s fate might rest this November. By virtue of accepting the nomination, Romney now has access to tens of millions of dollars his campaign has raised for the general-election season. The advent of super PACs, political groups with no limits on fundraising or spending, has already pushed the cost of the 2012 election to unprecedented levels, and the price tag is only likely to skyrocket over the remainder of the campaign.